There were two great recipes for sharing with friends on today’s show: a Coffee and Walnut Cake with a fruity twist, and lamb chops served with a piquant salsa verde. Start impressing your guests! 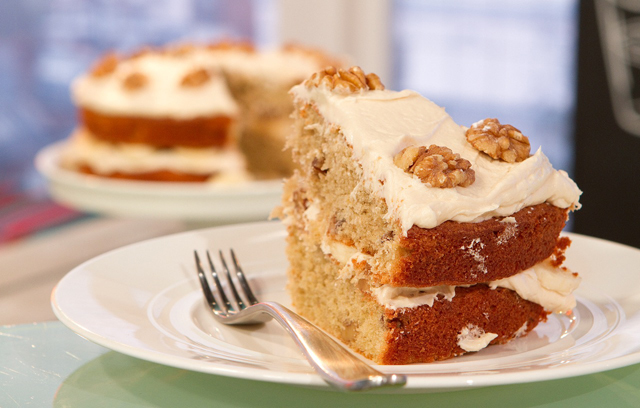 This coffee and walnut cake is a tempting teatime treat. Simon has topped it with a classic espresso-infused buttercream icing, but also added a layer of ripe bananas for a fresh, fruity hit. This cake is perfect for sharing with friends over a cup of tea, or of course, coffee. Add the eggs one at a time to the butter and sugar mixture, beating well to completely incorporate each egg before adding the next. Add the flour and walnuts and stir well to completely combine. Layer the bananas on top of one of the cakes and top with half the buttercream. Put the other cake on top and spread with the remaining buttercream. These lamb chops with salsa verde are a quick but impressive midweek dinner. The freshness of the salsa verde cuts through the rich meat and complements the creamy butterbeans. You can either buy individual French-trimmed chops or buy a trimmed rack of lamb and divide it into cutlets. To make the salsa verde, blend the herbs, mustard, capers, anchovies and seasoning. Add the oil in a steady stream to form a sauce. Cook the onion and garlic for 5 minutes until soft. Add the beans, rosemary, wine and stock. Bring to the boil and simmer for 12 minutes. Take off the heat, then stir in the butter and olives. Oil and season the lamb chops on both sides. Griddle for 3 minutes either side, with a sprig of rosemary on each. 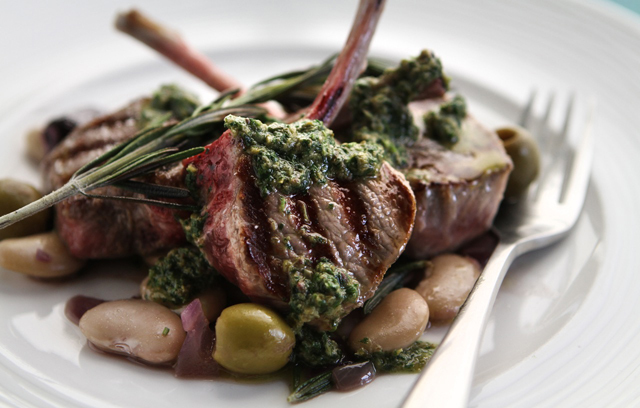 Serve a pile of beans topped with lamb chops and salsa verde. This entry was posted in Daily Brunch, Talking Ocado and tagged Channel 4, coffee cake, Cook, Cooking, cooking for friends, cooking from scratch, Daily Brunch with Ocado, entertaining, food, foodie, Global Food, good food, Groceries, home cooking, lamb chops, Ocado, Ocado deliveries, Ocado groceries, ocado.com, Princess, Recipes, salsa verde, shopping, Shopping at Ocado, Simon Rimmer, Tim Lovejoy, TV Chef by Ocado. Bookmark the permalink.